Investigator Weapons for Call of Cthulhu in the Classic era is a comprehensive collection of weapons available to stalwart investigators of the Cthulhu Mythos and their crazed cultist opponents. Investigator Weapons covers handguns, rifles, shotguns, submachine guns, machine guns, flamethrowers, melee weapons, explosives, and special ammunition; and gathers together all the spot rules for injury, environmental conditions, and firearms combat in one place, as well as introducing many optional rules for enhanced play. Each weapon is illustrated and described in detail, as are variant models. Significantly, each weapon’s operation is described, as are its typical malfunctions. Finishing each weapon description is the movie use of the weapon – so you can see it in action – and a comprehensive statistics bar. Keepers are not forgotten either. Typical weapons for non-player characters are suggested, as are likely weapons for cultists from around the world. A Keeper’s chapter examines the consequences of magic on firearms and ammunition, and the effect of firearms on Mythos creatures. 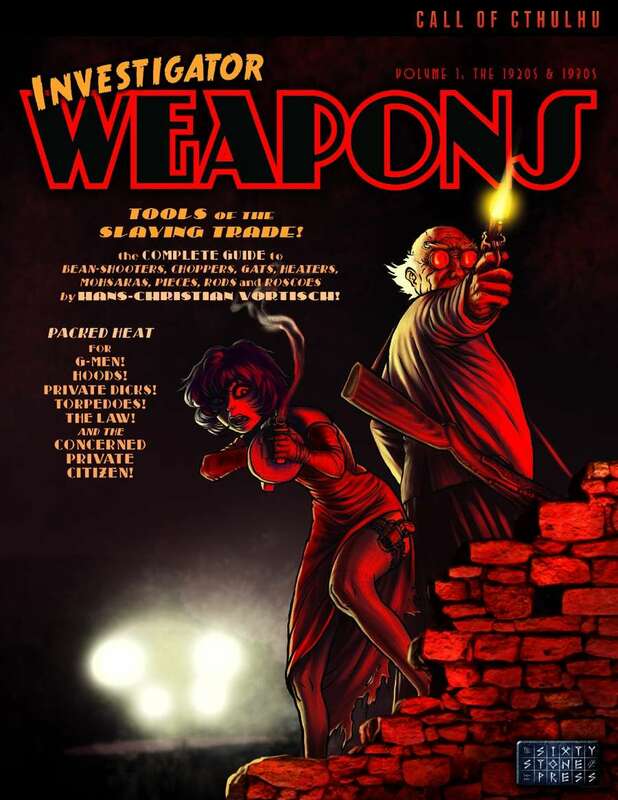 Investigator Weapons – the essential weapons book for Keepers and players of all editions of Call of Cthulhu. Also included in this purchase are separate weapons summary charts, weapons record sheets, and a rules summary sheet. The book is available as PDF and POD from this site. A softcover edition is available in games stores. This title was added to our catalog on March 25, 2012.